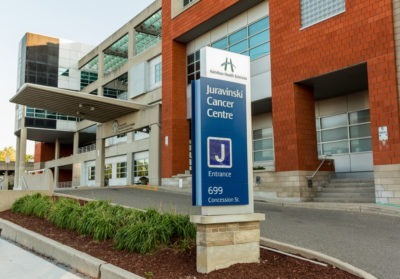 Our unit is made up of the New Patient Referral service and the seven outpatient clinics at the Juravinski Cancer Centre (JCC). The New Patient Referral service runs from 8am to 5pm daily, Monday through Friday. We receive and process referrals for over 7,000 new patients per year. All patient are encouraged to read our Patient and Family Handbook to help them with information about their care and experience at the JCC. Each clinic has between 9 and 16 exam rooms (77 in total). Over 110,000 patient visits take place annually in these clinics. Clinics run in half day periods Monday through Friday. Morning clinics run from 9am to 12pm and afternoon clinics run from 1pm to 5pm. Our New Patient Referral service team ensures the doctors and nurses have all of the essential information needed for an effective first visit. Our goal is to ensure every new patient is seen within two weeks of referral if capacity permits. New patients are referred to JCC from the community or hospital by family physicians, surgeons or other medical specialists. The team handles over 7,000 new referrals each year. Oncologists (cancer specialists), Specialized Oncology Nurses (RNs), Clerks and Health Care Aides work together to take care of patients who are attending appointments in the clinics. Patients may also be seen in the clinics by other health care providers such as Registered Dietitians, Advanced Practice Nurses, Clinical Trials Nurses, Palliative & Supportive Care Nurses and others. Patients check in with the clinic reception clerk who will ask the patient to swipe their health card and will check the patient’s current address, phone number and family physician. Every patient will be asked and assisted to complete a symptom assessment using a simple computer. This allows the doctors and nurses to know how you are feeling and how your treatments are affecting you. The Health Care Aide will assist patients into the clinic exam room when it is their turn, will often weigh the patient and will provide any personal health assistance the patient may need during their visit. Patients are usually seen in the same clinic at each visit, so they will come to know many of the staff.